Devika Malik was born with hemiplegia, which causes paralysis to one side of the body. She has overcome the challenges of her disability to become an international para-athlete, psychological counsellor and co-founder of the Wheeling Happiness Foundation. Devika Malik has been awarded the Queen’s Young Leader Award by Queen Elizabeth II at Buckingham Palace, London in recognition of her community development work as a co-founder of Wheeling Happiness and has also been recognised by Prime Minister Narendra Modi for her contributions to society. Devika has won Silver Medals at World Athletics Grand Prix in 2014 & 2016. She was the Asian Representative of the Commonwealth Youth Sports for Development & Peace, Commonwealth Secretariat from 2014 to 2017. She has Addressed 53 Heads of States, the British Royal Family and global dignitaries from Politics & Social Service fields, at the Opening Ceremony of the Commonwealth Heads of Government Meeting 2018, at Buckingham Palace London, regarding the importance of an inclusive vision for people with disabilities. She also addressed high level stakeholders at the first ever global Disability Summit in London on 24th July 2018. 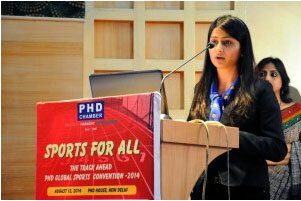 She is a leading voice for young people with disabilities at the Commonwealth and the United Nations and has represented India at many international forums, including the largest global youth leadership summit, One Young World with delegates from 193+ countries, she is also a TEDx speaker highlighting the benefits of sports for persons with disabilities. Devika Malik is also an advisory panel member and youth ambassador for national & international non – profit organizations like Bridges of Sports (India) and Include Me TOO (UK), bringing the interests of young people with disabilities to the fore. Braving Chest-below paralysis and spinal tumour treatment for past 19 years; Deepa is on a mission – Ability Beyond Disability. She is an international sportsperson par excellence and recipient of Five Prestigious President of India Awards & honours – Padma Shri (Ministry of Home Affairs); Arjuna Award (Ministry of Youth Affairs and Sports); President’s National Role Model Award (Ministry of Social Justice and Empowerment); Women Transforming India Award (NITI Aayog, United Nations India & MyGov) and ‘First Ladies Award’ (Ministry of Women & Child Development) as well as 5 state governments’ honours. She is a motivational speaker who has been conferred the International Human Rights Council’s ‘Exceptional Speaker Award’, among many other prestigious awards and recognitions to her name. She holds Four Limca World Records in the Adventure Category, she is the first woman to represent the country at international level sports in her category of disability and has won 23 International Medals in sports. 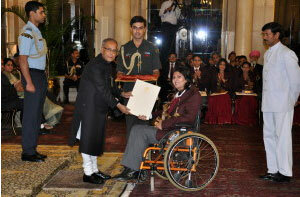 She is also the first ever Indian paraplegic woman swimmer, biker and car rallyist. Having created an Asian Record at Incheon Asian Games 2014, Deepa went on to represent the country at Para – Athletics World Championship, Doha 2015; and has become the First Ever Indian Woman to win a Silver Medal at Rio Paralympics 2016. Deepa Malik has once again created aNew Asian Record in Asian Games in October 2018. Deepa Malik has become the only Indian woman to win medals in 3 consecutive Asian Games (2010, 2014, 2018). Dr.(h.c.) Deepa Malik has been awarded Honoris Causa Doctorate by ITM University, Gwalior in recognition of her outstanding contribution to the fields of sports and adventure sports in India. Deepa contributed immensely towards better sports policies for physically challenged in her role as a member of the Working Group for the Formulation of 12th Five Year Plan (2012 – 2017). Deepa works closely with the government to implement progressive & inclusive policies. She is the ‘Clean India’ brand ambassador for NDMC and expert consultant for Disability Inclusive Accessible Infrastructure for Ministry of Housing and Urban Affairs ‘Smart Cities’ project. She is also an ambassador for Election Commission of India, encouraging citizens to cast their vote and spreading awareness about accessible polling booths. Numerous people with disabilities and non-disabled people alike have drawn inspiration from Dr.(h.c.) Deepa Malik and she continues to enable people as the co-founder of Wheeling Happiness. • Nominee for Loreal Femina Awards 2013 in “Women We Love Category” along with MC Mary Kom, Sridevi and Vidya Balan. • International Women’s day appreciation Award 2011 – Cancer Patient Aid Association New Delhi.